What would you do for someone you love? Would you lie? Would you leave? Would you kill? 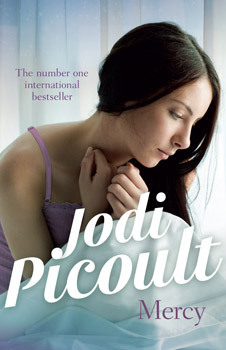 Jodi Picoult confronts these powerful issues in Mercy, which follows the path of two cousins driven to extremes by the power of love. Police chief of a small Massachusetts town, Cameron McDonald makes the toughest arrest of his life when his own cousin Jamie comes to him and confesses outright that he has killed his terminally ill wife out of mercy. A heated murder trial plunges the town into upheaval and drives a wedge into a contented marriage: Cameron, aiding the prosecution in their case against Jamie, finds himself suddenly at odds with his devoted wife, Allie. She is seduced by the idea of a man so in love with his wife that he'd grant all her wishes, even her wish to end her life. And when an inexplicable attraction leads to a shocking betrayal, Allie faces the hardest questions of the heart: when does love cross the line of moral obligation? And what does it mean to truly love another? Tightly woven with passion and a fast-paced plot, Mercy explores some of today's most highly charged emotional and ethical issues as it draws toward its stunning conclusion. Jodi Picoult is the author of twenty-one novels. Her most recent, The Storyteller, Lone Wolf and Sing You Home, have all been number one on the Australian and New Zealand fiction bestseller lists. Jodi lives in New Hampshire with her husband and three children.